Situated at the front of the estate fronting Atlantic Street and currently undergoing a comprehensive refurbishment. A detached unit with a dedicated service yard. Currently undergoing a comprehensive refurbishment. 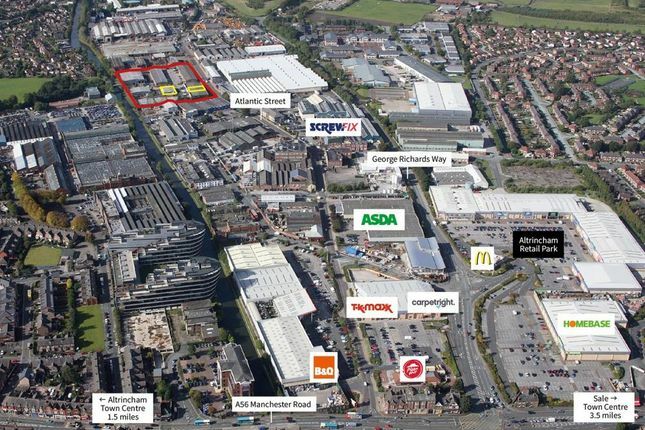 Stag Industrial Estate is prominently situated on Atlantic Street, close to Manchester Road (A56), which in turn provides direct access to both Altrincham town centre, 1.5 miles to the south and Manchester city centre 8 miles to the north. Navigation Road Tram Station lies within 1 mile and provides rapid access to both Altrincham and Manchester. Manchester International Airport is within 15 minutes drive time. The units are available on new, full repairing and insuring leases on terms to be agreed.